When challenged to come up with the Ultimate Burger as part of a sponsored post for Collective Bias® I created a Chicken Parmesan Burger. I love cooking but never follow recipes exactly. I like to be creative in my cooking and I’ve always wanted to create my own recipe but had never had an idea. When trying to come up with an idea for an Ultimate Burger, I started thinking about what I would consider an Ultimate Dish. Chicken Parmesan is a yummy dish and I make it myself. I used a recipe to learn how to make the dish, but I do it all my own now and have changed it up a few times too. However it’s a time consuming dish and not one you want to make in the heat wave we’ve been experiencing here. Having the oven on for hours just isn’t possible when it’s over 100 degrees Fahrenheit out. 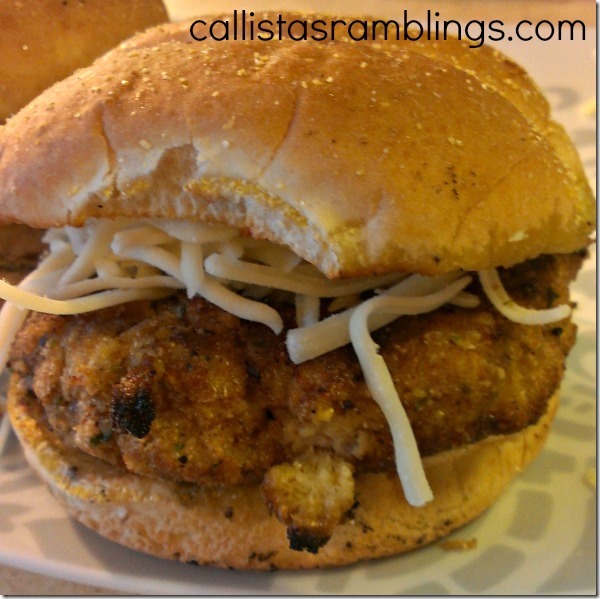 Chicken Parmesan Burger – Brilliant! So I put my thinking cap on and came up with a Chicken Parmesan Burger. You’ll notice however, that this isn’t a recipe. I don’t DO recipes. I tell you how to make the burger, but you’ll have to figure out the amount and cooking times on your own, like I do. Don’t be afraid to experiment! 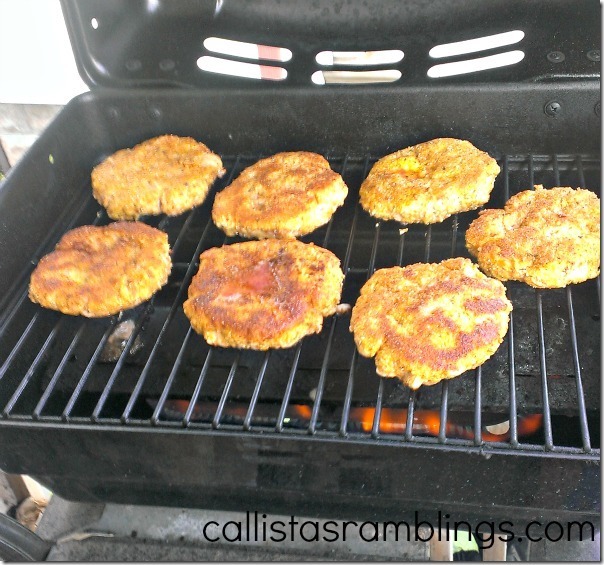 First make the ground chicken into patties like you would for hamburgers. If you want, you add whatever seasonings you like in with it, or even perhaps sauté some shredded carrot and minced celery to add to it. I didn’t add anything to this step and it’s the only thing that would have made the burger better. If you like a kick, add some hot sauce or a minced hot pepper. If you know how to make Chicken Parmesan, this step will seem familiar. You need to coat the patties in three different mixtures. (From right to left in the picture) Bowl One – Flour, Bowl Two – Egg and a little water, beaten, Bowl Three – Italian Breadcrumbs, Seasoned Salt and Parmesan Cheese, mixed. Get a frying pan ready with a generous amount of olive oil, heated to a medium heat. 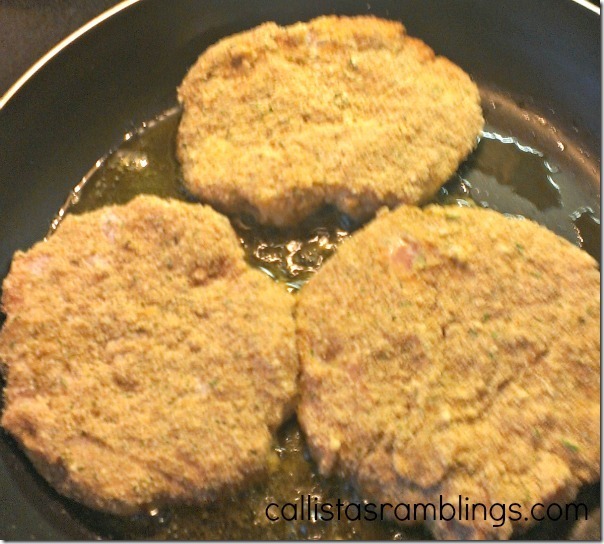 Coat each patty in the flour, then the egg and then the breadcrumb mixture, making sure it’s thoroughly covered in each. Place it in the hot frying pan and fry it a bit on each side, so it’s crispy and held together but the whole patty isn’t fully cooked. I did mine in batches. 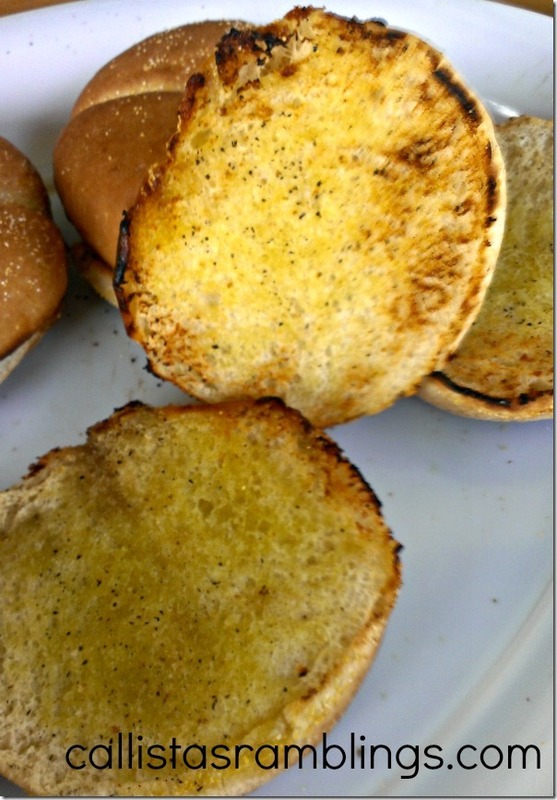 Set aside the burgers when they are crisped on both sides. Put them on the BBQ to finish cooking and get the yummy BBQ taste. Keep the heat low so it cooks the middle without burning the outside. While they are cooking, continue to Step Five. Buns are always better toasted but they are even better when you brush them with olive oil and sprinkle with salt and pepper first. After learning this technique on the Food Network, I do this for every burger bun. In the house, open the can of tomatoes and drain some of the liquid, put in a pot and set it to boil on medium high heat so it heats thoroughly and cooks off more of the liquid. If you chose regular canned tomatoes, you would add your seasonings here such as Parsley, Basil, Salt and Pepper and perhaps some green peppers, onion and garlic. Once it’s boiled you are going to blend it into a sauce. 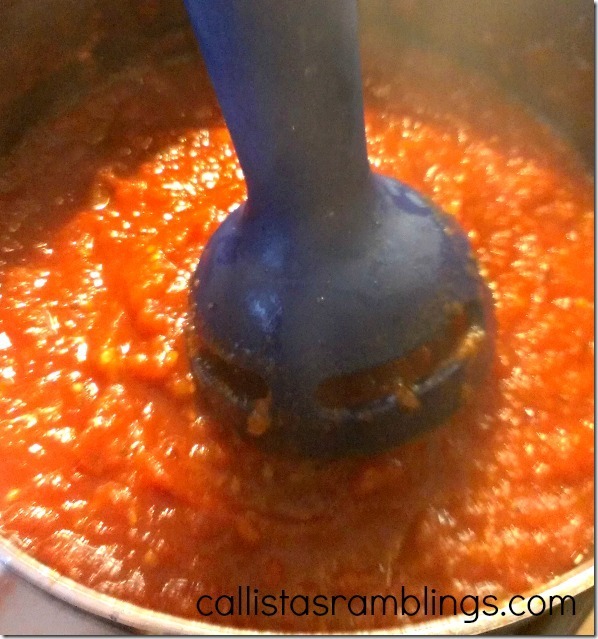 Blend a little for chunky sauce and a bit more for a smoother sauce. If it’s still too watery, drain some in a colander with small holes. Move the burgers over to stay warm and make room to toast your buns. 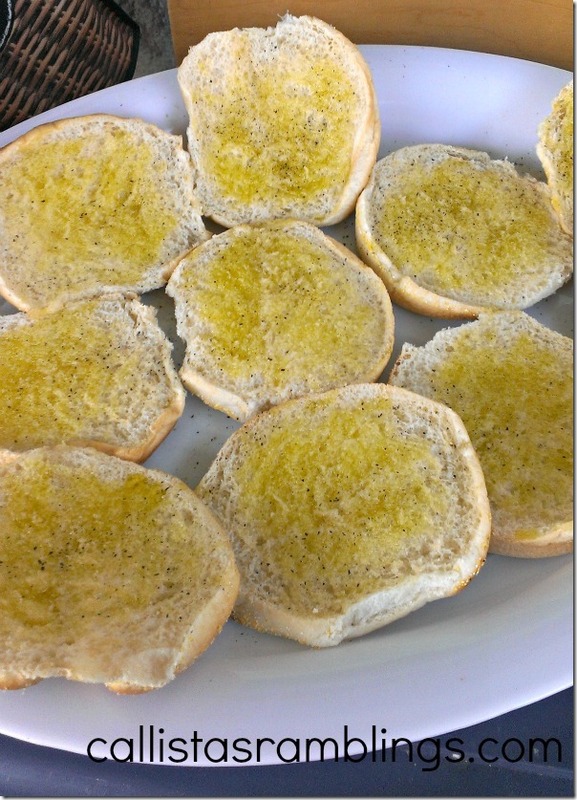 Keep a close eye on the buns as they can go from toasted to burnt easily, especially if your heat is up too high. Toast the way you like it. Mine are lighter because I like it lightly toasted. I put more of the sauce on the bottom bun and just spread a little sauce on the top bun before putting it on top. You can’t see the sauce in the photo below but it’s there! Voila! 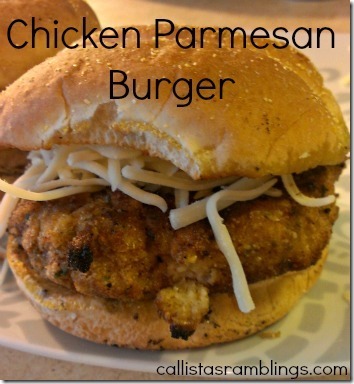 You have made a Chicken Parmesan Burger! It was more work than a regular burger but it is after all an ULTIMATE BURGER. If you find yourself craving Chicken Parmesan but it’s too hot to put on the oven, try this! I got the ingredients I was low on at The Real Canadian Superstore (Owned by Loblaws.) Check out my Ultimate Burger Google+ Album to see my shopping trip and find out why I was amazed at the watermelon display and why I opened crackers in the store.